Wow! Its been TOO long. A lot has happened since my last post in August-mainly lots of snow, lots of designing, and one cute baby being born now 3 months old. I also opened my Design store on Etsy. It will be the home for flower appliqués, hair and bridal accessories, PDF tutorials, baby items, and possibly some carriers. I am also working on a PDF of the hood to headrest tutorial that you love so much! 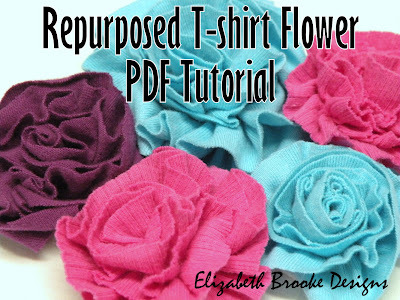 In honor of all these exciting things I have included my tutorial for the cheap, fun, and easy T-shirt flower below. It is currently in my Etsy store for $3 so you get a sweet bargain here for free :) If you like it, check out some of the other patterns I am working on in my store. I am patterned challenged which is why I started writing my own patterns packed with photos. I have so many pattern projects in the works, so get ready! Visit here for more tutorials! And feel free to email me Brooke at elizabethbrookedesigns@gmail.com with any questions. I want to make some! ... now to find the time to do it. :) Nice work, Brooke! Yeah! I see you put it back up. I'm pumped.